The Spanish names Jaime, Santiago, Diego and Jacobo and the English names James and Jacob are all cognates since they have the same source. As you can imagine, some of these names have quite interesting stories. They all stem from the name of two of the apostles of Jesus, typically the most well-known of the two, known in English as James ‘the Greater’, or James son of Zebedee (not to be confused with James ‘the Less’, son of Alphaeus, or with James, brother of Jesus, also known as James the Just, who is sometimes confused with James ‘the Less’). In Spanish, James ‘the Greater’ is known as Santiago ‘el Mayor’ (or de Zebedeo), James ‘the Less’ as Santiago el Menor. The name of all of these Jewish people in Hebrew was יַעֲקֹב (transliterated variously as Yaʿqob, Yaʿaqov, or Yaʿăqōḇ), a very common Hebrew name since it was the name of the Hebrew patriarch, known as Jacob in English and Jacobo in Spanish (he was son of the patriarch Isaac and his wife Rebecca). It is not clear what this Hebrew name means, for some argue it is derived from the root עקב (ʿqb) that means ‘to follow’ or ‘to supplant’ and others that it is derived from the word for עֲקֵב (ʿaqeb) meaning ‘heel’. Thus, depending on what person we are talking about, in English, this Hebrew name turned into James (New Testament apostle) or Jacob (Old Testament patriarch). In Spanish, the two Biblical names were Santiago and Jacobo, respectively. The first one of these will require some explanation, as you can imagine, since it looks so different. Additionally, Spanish also has three more names derived from this Hebrew name: Diego, Yago, and Jaime. And English has the cognate Jake, which is derived from the name Jacob. One of the reasons for the proliferation of versions of this name has to do with whether the name comes from Ecclesiastical (Church) Latin or from Vulgar Latin. Eng. Jacob and Sp. Jacobo are fairly learned versions of the Latin name Iacobus, which is a Latin adaptation of New Testament Greek Ἰάκωβος (Iákōbos). Remember that Latin initial Ĭ became consonantized before a vowel and eventually it came to be written with the letter 〈J〉 derived from the letter 〈I〉 (cf. Part I, Chapter 8, §8.3.2.3, Chapter 10, §10.3.9). One major difference between the Latin word and the Spanish one has to do with stress. The Biblical Latin name was stressed on the first (antepenultimate) syllable, just like in the Hebrew original, even though the Greek name had a long penultimate vowel. Sp. Jacobo, on the other hand, has penultimate stress. This Latin name, or the original Hebrew name, had a patrimonial descendant in Spanish (north-western Hispanian Romance), namely Iago or Yago, from an earlier Iaco. (Another version of this name is Yagüe.) This name maintains the original initial stress, shows loss of the final syllable, and voicing of the middle consonant ‑c‑, which changes to ‑g‑ (cf. Part I, Chapter 10, §10.4.3.1). The name Iago, also spelled Yago, is attested in Old Spanish. However, the name of the apostle, Iago, became inextricably tied to his appellation Sant ‘Saint’, an apocopated version of Santo (Modern Sp. San), resulting in Santiago (Sant+Iago; Ecclesiastical Latin Sanctus Iacobus). Thus, the blended Santiago came to be the new version of Iago. These two words were so fused that most Spanish speakers today do not even realize that the name Santiago contains the word Sant(o) in it and one even hears the redundant appellation San Santiago ‘Saint James’, though he is more often referred to, however, as el apostol Santiago ‘the apostle James’. The name Iago or Yago pretty much disappeared from Spanish after the meshing of this name with the epithet or appellation Sant. This name’s is known today mostly as the name of a villainous character in Shakespeare’s play Othello. (It is also the name of the parrot in Disney’s film Aladdin.) He is the one who convinces Othello, a jealous Moor, that his wife Desdemona is cheating on him, which results in Othello killing her. When Othello discovers that she had been faithful, he kills himself. Shakespeare’s story is plagiarized from Giovanni Battista Giraldi Cinthio’s story “Un Capitano Moro” in his book Gli Hecatommithi (1565). Iago’s character is not named in Cinthio’s story and it is not known where Shakespeare borrowed the name Iago from, but it is likely that it came from Spanish. However, Iago is the version of the name James in Welsh too, as well as in Galician and Portuguese. The apostle James was very important in Western Christendom, especially in the Iberian peninsula. According to legend, the apostle James preached in Roman Hispania in the decade after 33 CE. There are different versions of the story, but in all of them the apostle ends up in the Galicia region in north-western Hispania. Another aspect of the legend has the Virgin Mary, the mother of Jesus, appear to James in the city of Caesar Augusta (modern-day Zaragoza) in the year 40 upon a pillar, hence what’s known as the apparition of the Virgin of the Pillar or Our Lady of the Pillar (Sp. Virgen del Pilar or Nuestra Señora del Pilar) in this city, which is venerated to this day. James eventually returned to Palestine and would be the first of the apostles of Jesus to be put to death, by king Herod Agrippa, in the year 44. After this, the legend says that his disciples brought his remains back to Galicia. A thousand years later, this legend was believed by many Christians in Hispania, even though there was no evidence for it, and a claim was made that the remains of the apostle James had been found sometime in the 9th century in what is now the city of Santiago de Compostela. Because of this, this city became one of the most important cities of pilgrimage of western Christendom in the Middle Ages, bringing people from all over Europe along the Way of Saint James (Sp. Camino de Santiago) to the basilica that was build, where legend says his bones are buried. According to legend, St. James appeared at a mythical 9th century battle in which he helped Christians kill thousands of Moors. 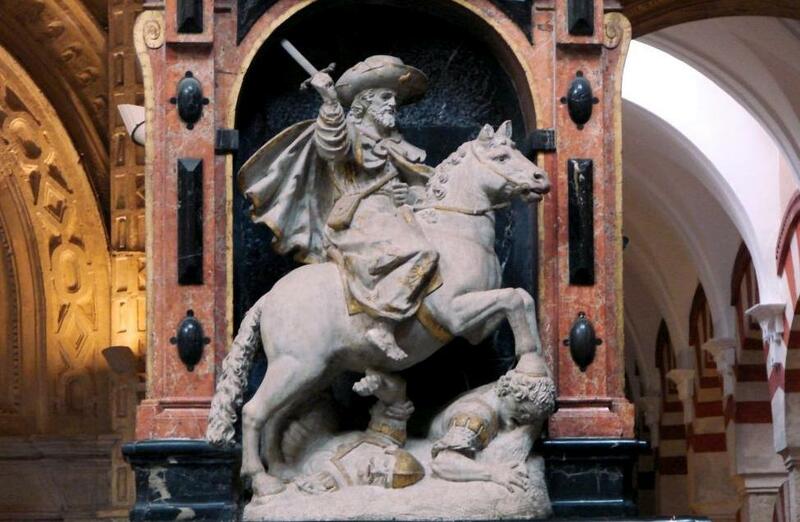 Henceforth, the saint was known as Santiago Matamoros ‘(Saint) James the Moor-slayer’ and he would become an inspiration for Christian fighters during the Reconquista, who attacked Muslims with the battle cry Santiago! Besides the name of the famous city in Galiza, Santiago de Compostela, Santiago also became the name of other cities in the Spanish-speaking world, such as Santiago del Estero in Argentina, capital of the province with the same name, Santiago del Chile, capital of the country. In Colombia we find Santiago de Cali, better known as Cali. In Cuba we have Santiago de Cuba, the name of the second largest city and the easternmost province. In Guatemala, the city of Antigua, the old Ciudad de Guatemala ‘Guatemala City’ was originally known as Santiago de los Caballeros de Guatemala, a name by which it is still known. Going back to the different varieties of the saint’s name in English and Spanish, we move now to Eng. James and Sp. Jaime, which derive from a from a Vulgar or Late Latin version Iacomus of Latin Iacobus, which was an adaptation of the New Testament’s Greek version of the Hebrew name, Ἰάκωβος (Iákōbos). The version Iacomus seems to have been found mostly in the Occitan Romance language of southern France. It may actually have been Iacombus before that, with an intrusive m or else somehow the bilabial voiced b became mysteriously nasalized. This Iacomos became James in Old French, also found as Gemmes or Jaimes. The sound changes that took place here, though surprising, are quite well understood: the intervocalic ‑o‑ was first lost, resulting in Jacmo or Jacme and then the ‑c‑ was vocalized in implosive position. As for the final vowel, it was obviously a reduced vowel and its spelling changed to e.
English borrowed this Old French name as James [ˈʤeɪ̯mz] in the 13th century. From there it made it to Scotland, where the name was more popular than in England, with several Scottish kings bearing that name. When king James VI of Scotland inherited the throne of England in 1603, he became the first ruler of all of Britain, as James I, and the name grew quite popular in English too. The Modern French version of this name in French, Jacques [ʒak], which is a patrimonial word that comes from one of the original Latin versions of the name after the loss of intertonic ‑o‑ and the word’s final sounds. The name Jaime [ˈxai̯.me] is now a Spanish name, but this name did not evolve in Spanish (Castilian Romance), but rather in Aragonese, from which it was borrowed by Spanish. The source of the name is obviously Occitan, however. Catalan, which is closely related to Occitan, has its own version of the name with a different vocalization. In Catalan, which is closely related to Occitan, the version of this name is Jaume [ˈʒau̯.mə], a very common name in this language. English also has a name Jaime, which is a variant of Jamie, which was originally a Lowland Scots diminutive of the name James. This name has also been used as a woman’s name in English since the late 19th century. As we said, the Spanish name Diego is also related to Iago and Jacobo. It seems to have been derived from the name Santiago by an erroneous reanalysis of this word as being composed of San and Tiago (as opposed to Sant and Iago). From this Tiago, or perhaps from a variant Diago, comes the name Diego, also attested early on as Diago. The same name is still attested in Portuguese as Tiago. In the Middle Ages, the name Diego was Latinized in documents as Didacus, under the assumption that that was the source of the name, which would have come from the Greek name Διδακμος (Didakmós) which meant ‘learned, erudite’. This, however, seems to be a mistaken etymology and it is more likely that Didacus was a Latinization of Diago. Once Diego began being used as a name, it was inevitable that sooner or later someone with that name would be canonized in the Catholic Christian religion and that is just what happened when Franciscan priest Fray Diego de San Nicolás, also known as Diego de Alcalá (c. 1400-1463), a missionary to the Canary Islands, became San Diego ‘Saint Diego’. From this saint’s name comes the name of the eighth-largest city in the United States in Southern California. The name Diego was a very common one at one point and it gave rise to some very common patronimics in the kingdoms of Castile and Leon, which eventually became last names. These names are Díaz and Diez, formed with the name Diago or Diego and the patronymic suffix ‑ez (cf. Part I, Chapter 9, §9.6). Diego plus the suffix ‑ez should have resulted in Dieguez, but the loss of the intervocalic ‑g‑, a very common change in Old Spanish, resulted in these two variants of the name. The last name Díaz is one of the 14 most common ones in Spain and the 4th most common in Chile, for example. As is often the case, from a masculine name such as this, feminine names have been derived through time. None seem to have been created from this name in Spanish or directly in English but from the French name Jacques mentioned above, in French a feminine form Jacqueline was created. This name was borrowed into English and besides Jaqueline, it has other variants, such as Jacklyn and Jaquelyn. The most common diminutive derived from these names is Jackie. We should mention that other languages have adapted this name in their own peculiar ways. In Italian we find Giacomo, Iacopo, Jacopo, Giacobbe, and Lapo (diminutive of Jacopo). In Portuguese, Jacob, Jacó, Iago, Santiago, Tiago, Jaime, Jácomo, and Diogo. In German, Swedish and Norwegian, the main variants are Jacob and Jakob. In Arabic it is Yaʿqūb. In Modern Greek, we find Ιάκωβος (Iákovos) Ιακώβ (Iakóv), and Γιάγκος (Gyánkos). In Irish, it is Séamus, Séamas, or Shamus. Finally, in Russian we find Yakov and its diminutive Yasha. It is not clear where the name Compostela, the second part of the name of this city, comes from. Some have argued that it comes from the Latin phrase campus stellae ‘field of the star’, in reference to a start that according to legend led a certain Teodomiro who is said to have found the saint’s bones. Others think that the name has at its core the Latin passive participle composita of the verb componere, which would mean something like ‘fixed, repaired’, in reference to the fact that the city was destroyed by the Moors (Almanzor) and had to be rebuild and fortified in the 11th century. Actually, the truth is that nobody knows the actual source of the name. The official name of the new Ciudad de Guatemala is Nueva Guatemala de la Asunción. The country’s capital was moved to this new location, along with its popular name, after an earthquake partially destroyed the old Ciudad de Guatemala in 1773. Henceford the old Ciudad de Guatemala has been known as Antigua, short for Antigua Ciudad de Guatemala ‘the former Guatemala City’. The name Guatemala comes from the Nahuatl Word Quauhtemalan, which meant ‘place of many trees’, which is what the Aztecs called this region. [i] Source: By Marshall Henrie - Own work, CC BY-SA 3.0, https://commons.wikimedia.org/w/index.php?curid=28510623; accessed 2017.12.07.